the most sought-after address in The Bahamas. 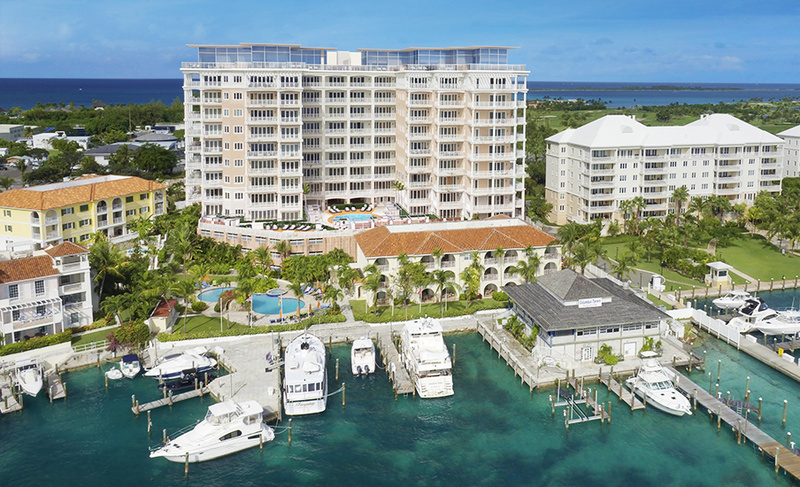 One Ocean Bahamas waterfront real estate is ideally situated on Nassau Harbour, Bahamas, between Atlantis, Ocean Club, and One&Only Resort. 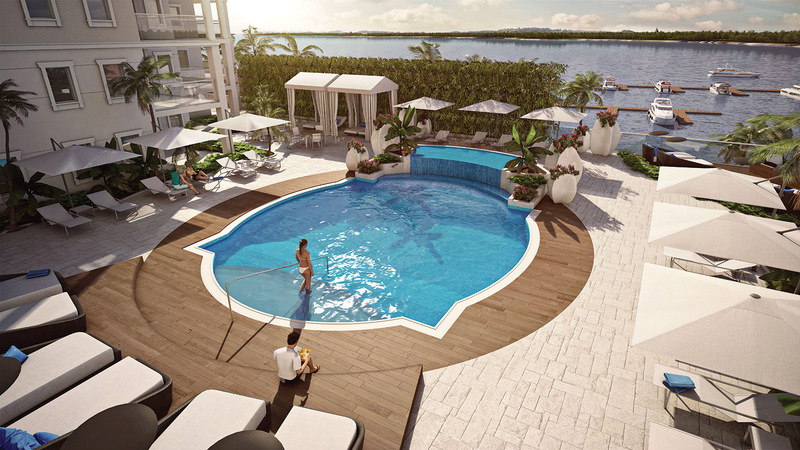 Nassau's rising sweet spot, One Ocean is the tallest residential building on Paradise Island. One Ocean’s spacious residences and modern luxuries make these simply the best waterfront homes in the Bahamas. Huge outdoor living rooms look over panoramic ocean views. You're an easy walk from restaurants, shopping, nightlife, and beaches, but you might never want to leave your sun lounger on the pool deck. Our Limited Priority Reservation Program includes a selection of 2- and 3-bedroom residences, as well as 4-bedroom penthouses. A stunning penthouse roof crowns this 10-storey tower that rises higher than any other residential building to enjoy Paradise Island’s most expansive views. 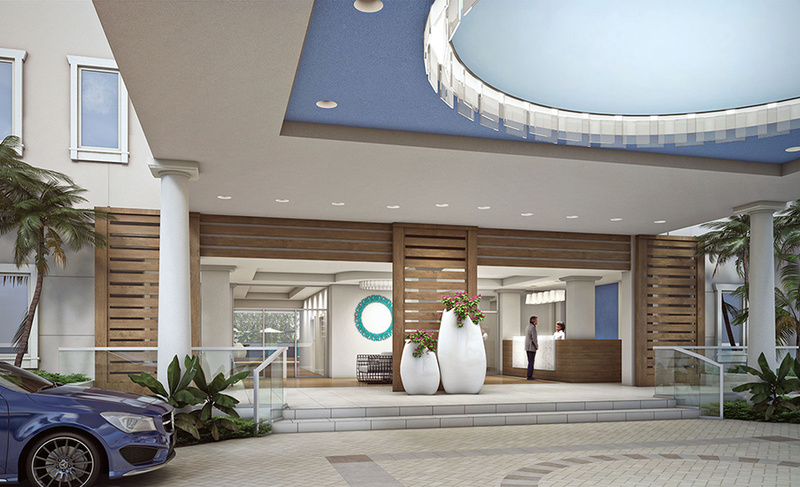 The welcoming porte-cochère flows into a breezeway where lounge seating gives you a space to slow down and plan the rest of your day or evening. The breezeway opens to the lushly landscaped pool deck, and residents-only gym. Catch up on your reading, float in the pool, daydream on a lounger. 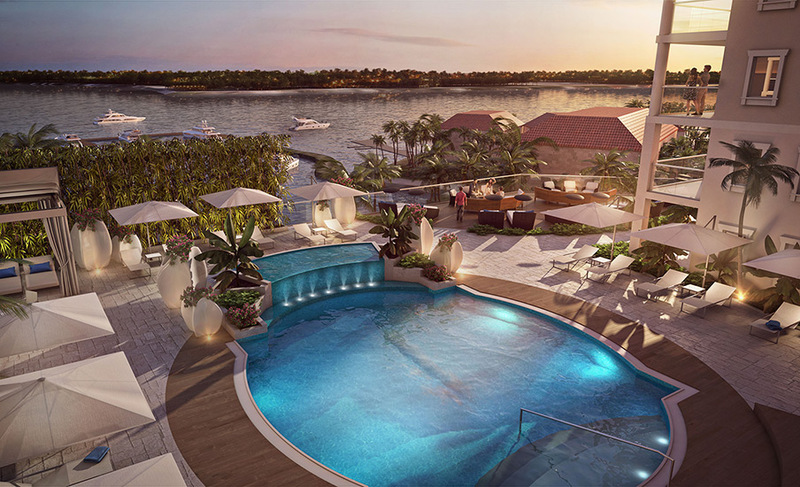 The garden-level pool deck looks out to Nassau Harbour and features multiple outdoor rooms: in the sun, under trellised cover, and facing sunset views. A waterfall tumbles into the pool and cabanas have drapes to let you control sun, shade, and privacy. Learn more about One Ocean Residences and Penthouses, and receive detailed information including floorplans, interiors and pricing. Paradise Now, sign up and receive information about One Ocean. By registering you are opting in to receive newsletters, e-mail offers and updates. We do not share e-mail addresses with third parties. All e-mails will come from One Ocean. If you do not receive an email after registering, please check your junk mail. One Ocean Bahamas takes the utmost care to ensure that the personal information we obtain from you is not used in a way that you may not be aware of or may not be agreeable to. You may wish to submit an information request about the One Ocean Bahamas property, participate in one of our promotions or subscribe to our e-mail or postal mail lists. In response, we may ask for information such as your name and address. In the event you opt to provide us with this information, we will only use it for the purpose specified by you at the bottom of the information gathering form. In deciding whether or not to join such lists, please note that they are only used for One Ocean Bahamas purposes. We do not sell, rent or share any of your personal information with any other party including third-party joint promoters, nor use it for commercial purposes. One Ocean Bahamas is interested in improving the Site and may develop and offer new features and services. We monitor aggregated data regarding use of the Site for marketing purposes and to study, improve and promote use of the Site. In connection with such purposes, One Ocean Bahamas may share aggregated data with third parties collectively and in an anonymous way. Disclosure of aggregated data does not reveal personal information about individual Site users in any way that identifies who they are or how to contact them. • One Ocean Bahamas may monitor and, when we believe in good faith that disclosure is required, disclose information to protect the security, property, assets and/or rights of One Ocean Bahamas from unauthorized use, or misuse, of the Site or anything found at the Site. • One Ocean Bahamas may disclose information when required by law; however, only to the extent necessary and in a manner that seeks to maintain the privacy of the individual. You can opt-out of receiving targeted ads served by us or other advertising companies: You may use the NAI opt out tool here, which will allow you to opt out of seeing targeted ads from us and from other NAI approved member companies. Please be aware that One Ocean Bahamas has designed this Site to be used for information only purposes by all ages. However, as with any Site parental consent is encouraged. You must be at least 18 years old to request information and/or submit personal information on our Site. Should One Ocean Bahamas inadvertently acquire personal information or any other data from users under the age of 18, One Ocean Bahamas will not knowingly provide this data to any third party for any purpose whatsoever, and any subsequent disclosure would be due to the fact the user under 18 used the Site and submitted personal information without solicitation by or permission from One Ocean Bahamas. One Ocean Bahamas may provide links to other websites that we believe might offer you useful information and services. However, those sites may not follow the same privacy policies of One Ocean Bahamas. Therefore, we are not responsible for the privacy policies or the actions of third parties, including without limitation, any web site owners whose sites may be reached through this Site, nor can we control the activities of those web sites. We urge you to contact the relevant parties controlling these sites by accessing their on-line policies for the relevant information about their data collection practices before submitting any personal information or other sensitive data. E-mail communication to and from our site is not secure unless clearly noted otherwise. This is a risk inherent in the use of e-mail. Please be aware of this when requesting information or sending forms to us by e-mail. When working with our internal database created online opt-in activity on the oneoceanbahamas.com site, we employ industry standard encryption technologies to help protect consumer data. If you have any questions about our policies, please contact: myles@wptrealestate.com. Thank you for you interest in One Ocean.